Our CNC machining centres are bought from famous CNC machining centres manufacturers in China so the quality are excellent. 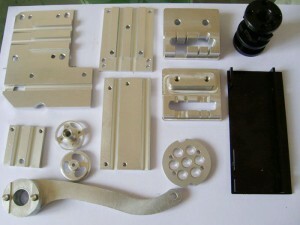 We also have a group of operators who are specialized in the operation of CNC machining centres. 1. Material: Carbon steel; Stainless steel, aluminum alloy; Brass alloy; Tinplate, copper; Stannum bronze; Silicon bronze; Zinc alloy; Gray iron; Ductile iron; Malleable iron; Tungsten steel, etc. 2. Machining processes: Metal fabrication, machining, welding, forming, shaping, punching, drilling, turning, milling, grinding, chip formatting, rolling, stamping, deep drawing, bending, spot or seam welding, spinning, forging, sand casting, die casting, investment casting, etc. 3. Surface treatment: Polishing, zinc plating, nickel plating, chrome plating, powder coating, e-coating, dip coating, phosphate coating, anodize, PVC powder coating, dichromate plating, decrement plating, etc. Our main customer are in USA, Israel, Chile, Greece, Spain, Middle East and many others. Such as EXTRONICS, Samsung, LG, OBI, ASUS, FUJITSU, ECI, AIRSPAN, SURF and so on.